How can Remedial Massage treat a Calf Tear? 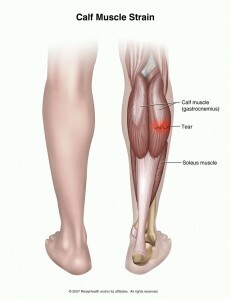 How does Remedial Massage treat a calf tear? The ‘Calf Muscle’ is a collective term for the musculature located on the posterior of the lower leg (on the back of the shin). It is made up primarily of two muscles, the Gastrocnemius on top and Soleus underneath. They run from just above the back of the knee and join onto the foot via the Achilles tendon. The muscle’s main roles are to plantar flex the foot (point toes into tippy toes) and to assist in flexing (bending) the knee. A ‘strain’ is a tear in a muscle. It is often confused with the word ‘sprain’ which is a tear to a ligament, not a muscle. You may feel as though you have been hit in the leg and it is possible you may hear a noise such as a pop depending on severity. You will experience a sudden onset of pain and potential bruising and swelling. 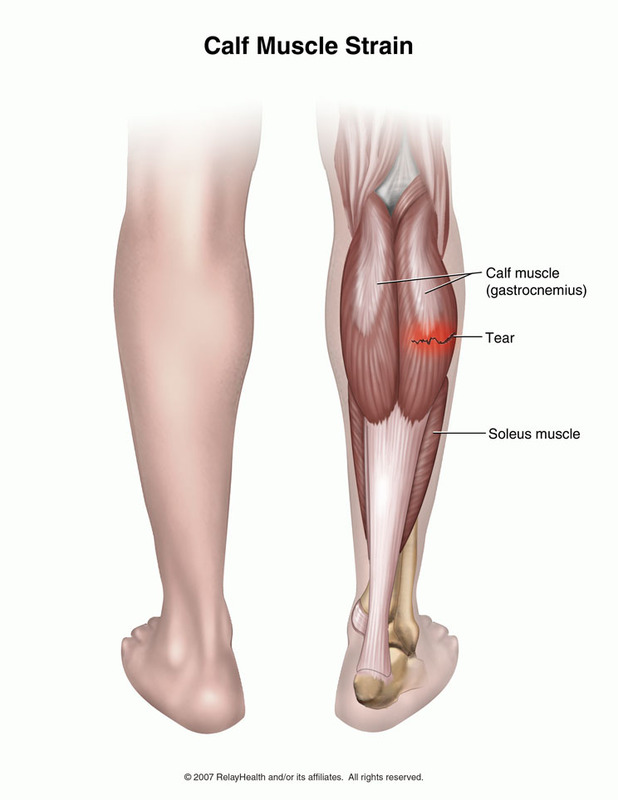 Calf muscle tears typically occur during acceleration or changes in direction. However, are not limited to these activities. How can I help my calf strain? Applying R.I.C.E. (Rest, Ice, Compression, and Elevation) is essential. Ice should be applied as soon as possible to help to quickly stop any internal bleeding. Ice can be applied for 10 to 15 minutes every hour initially reducing frequency as pain and swelling goes down. Use a compression bandage or sleeve. A compression bandage can be applied immediately to help stop swelling but it should only be applied for 10 minutes at a time as restricting blood flow completely to the tissues could cause more damage. Seek the help of a Myotherapist (an Advanced version of Remedial Massage). A Myo will help grade the severity of the strain as well as provide treatment and advice on healing. Assess the extent and site of the tear, as well as the initial inflammation to identify the severity and therefore the appropriate treatment, rehab, and prognosis. Create a treatment program to ensure strong scar building and muscle repair, reduce pain, and return muscle strength and range of motion. Return you back to your sport of choice as soon as possible with a strong calf and better biomechanics to reduce your chances of re-injury. Call Mobilise today to help with calf or other muscle tears, to get the best treatment for your injury, and get you back to what you love sooner!